This is a repost, but it bears repeating since it's powerful, helpful, and not obvious. John V and Gabor at the OpenOffice.org Forum helped me find this solution. 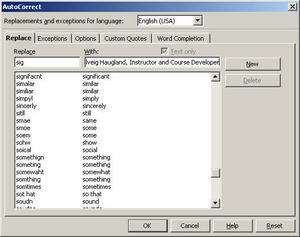 See also this blog on bringing text files into spreadsheets. I realized a few weeks ago that I have rarely if ever written or blogged about footnotes. In this season of pulpy beach reads, then, let's make a 180 and talk geeky, intense, length footnotes. The basics are very simple. Click where you want the number to appear, in the text. To insert an automatically numbering footnote, just leave the defaults as is. Click OK.
You'll see the number in the text, and a number at the bottom of the page. Type the footnote itself at the bottom of the page. Now, what happens when you insert another footnote? Exactly what you might expect. And you see the new number in the text and at the bottom, with the renumbering done automatically. Also there's less text on the page from the normal body flow since you need more space for the footnotes. Now, let's say you want something other than plain old numbers. You can choose a special character instead; just select Special Character and click the little ... browse button. However, keep to the standard fonts, don't switch to Dingbats, since then the character won't show correctly in the document itself. Select a character and click OK.
Then click OK again in the Insert Footnote/Endnote window. You'll see the character in the text, and with the other footnotes at the bottom of the page. NOTE that when you select a character there is no numbering. Let's talk about endnotes, now. Again, it's what you might expect. Instead of the text going to the foot of the page, it goes to the end of the document. Select Endnote instead of Footnote. The number (or character) appears in the text. NOTE THAT END NOTES AND FOOTNOTES ARE NOT CONSECUTIVE. YOU CAN HAVE ENDNOTE 1 AND FOOTNOTE 1 IN THE SAME DOCUMENT. YOU CAN CHANGE THIS IN SETUP UNDER TOOLS > FOOTNOTES AND ENDNOTES. And the space to type the endnote text appears at the end of the document. To go back and change the attributes of a footnote, i.e. change it to an endnote or change the character used, right-click on the number in the text and choose Footnote/Endnote. You have a huge amount of control over how the notes look and behave. Choose Tools > Footnotes/Endnotes. The settings are pretty straightforward. For endnotes, see below. For endnotes, the same explanations apply to a subset of the options. Here are some useful posts I've done lately, for a class I'm teaching. My post on the pagination extension. This is a template for a tri-fold brochure. It uses connected frames. Right-click on the link and choose to save it to your computer if you'd like to look at it. Start typing in the lower right of the six frames and the text will flow. Let's look at this document. It's a nicely organized multiheading document about Colorado tourism with five levels of headings, starting with ChapterTitle, then Heading2, and so on down. The Navigator window is shown here (if you haven't used it, press F5 to show it; it's great). 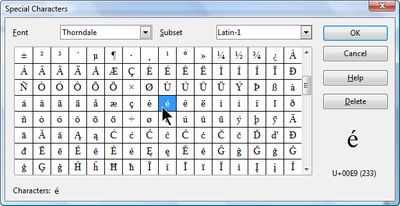 Outline Numbering is set up to match the intended use of each heading style. Chapter Title is the top level style, and so on. Without Outline Numbering being set up under Tools > Outline Numbering, we wouldn't have the Navigator looking the way it does. Or the table of contents (next) looking like that. Here's the document's table of contents, feeding off those levels, and showing all five because I didn't restrict it to fewer. But let's say you want some more power and flexibility. You want something in the TOC that's not in the headings. For instance, here's a paragraph in the middle that's kind of important. Maybe you just want this one (the heading, not the corresponding bulleted list) in the TOC as well but you don't want to make it a big level 2 or 3 heading. To do that, just select that paragraph, then choose Format > Paragraph. In Outline and Numbering, select the level you want that paragraph to appear at, in the table of contents. Then click OK.
Then update the table of contents, and you see that paragraph.